First, some background. 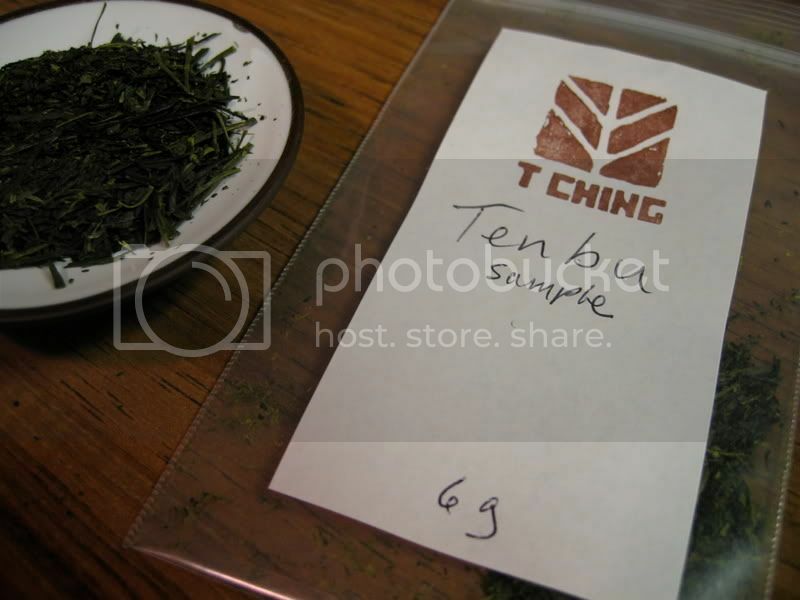 T Ching has started to hold online tea tastings, where they send samples of select teas to a number of registered tasters who agree to taste the teas and post their notes online. 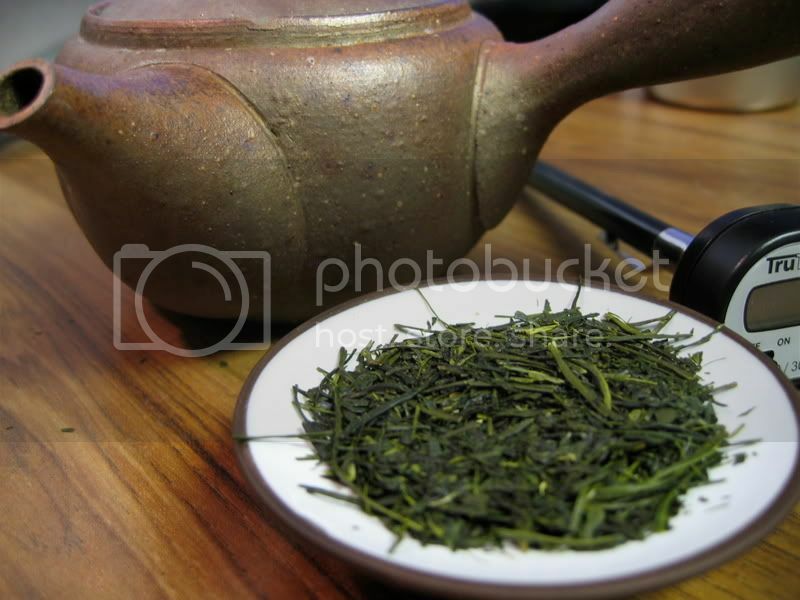 This time, the category is shaded sencha. 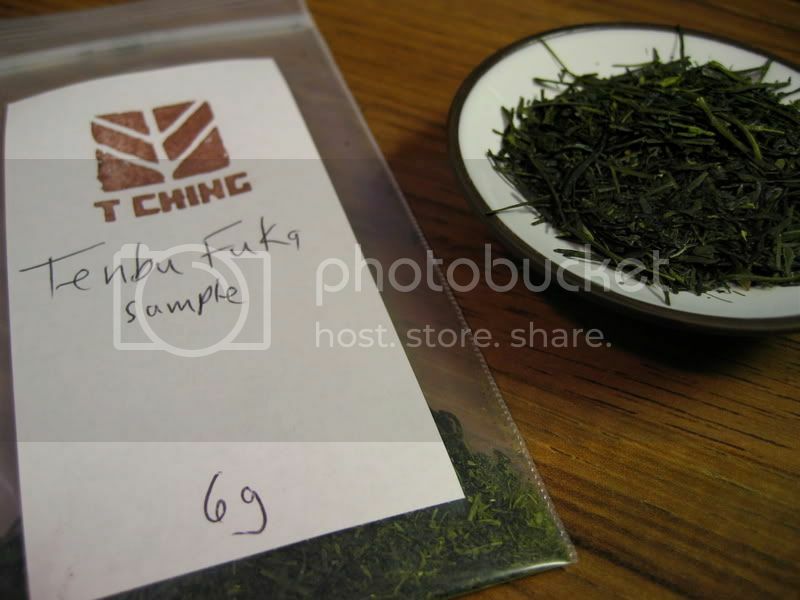 6 gram samples of two shaded senchas (Tenbu and Tenbu Fuka) were sent out, and tasting notes are beginning to accumulate here. I have already posted my notes over at T Ching, but I figured that I'd post them here too. (Why not?) The only differences are that I've added links and images, I've bumped up the grade for the Tenbu Fuka, and I've changed some of the formatting to make it more like the rest of my reviews. The brewing parameters were identical for both teas: Unglazed Kyûsu (roughly 8oz volume); Brita-filtered tap water; 3 grams tea / 7oz water; 145°F for all infusions; 60s, 15s, 15s, 15s, 30s, 40s, 50s. Let's start with the dry leaves. 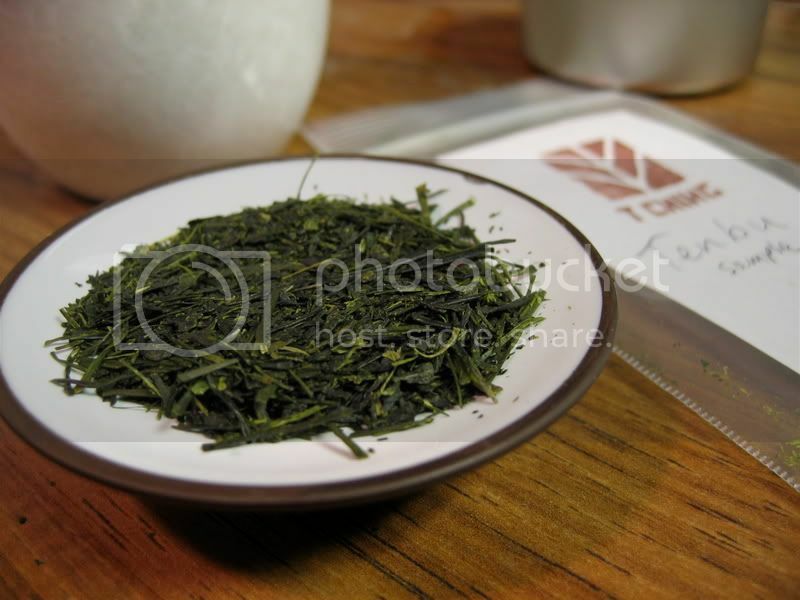 They had a nice dark green color, with a fair amount of fannings (though this is not necessarily a bad thing in sencha). Also of note was the deep, grassy aroma. There were some marine notes too, but not much compared to some other senchas (like the fukamushi sencha I reviewed a long time ago). There is no hay smell at all, which is a good indicator of freshness. The liquor was consistently a gorgeous, vibrant green. The first infusion was more peridot, followed by emerald, then lime in subsequent infusions. I tried to take a picture of the various infusions, but the color was not represented well at all. See Steven Dodd's review for a photo of the liquor color-- he was more successful than I was. Now, on to the most important part: the taste. I thought this was an absolutely stunning tea. The liquor was wonderfully sweet, even candy-like. The first two infusions also had surprisingly thick mouth-feel, which I liked very much. There is little astringency, and I detected just a hint of grassiness in the first few infusions. I thought it was truly spectacular that this sencha made it through 7 infusions. To be fair, the 7th infusion was weak and a bit insipid, but it was still tea (and good tea, I might add). When I first read that we would be preparing 5 infusions of a sencha, I thought someone was marginally insane, but needless to say I was proven quite wrong. Overall, I think this is a wonderful tea, and I would certainly purchase more if the option were available. 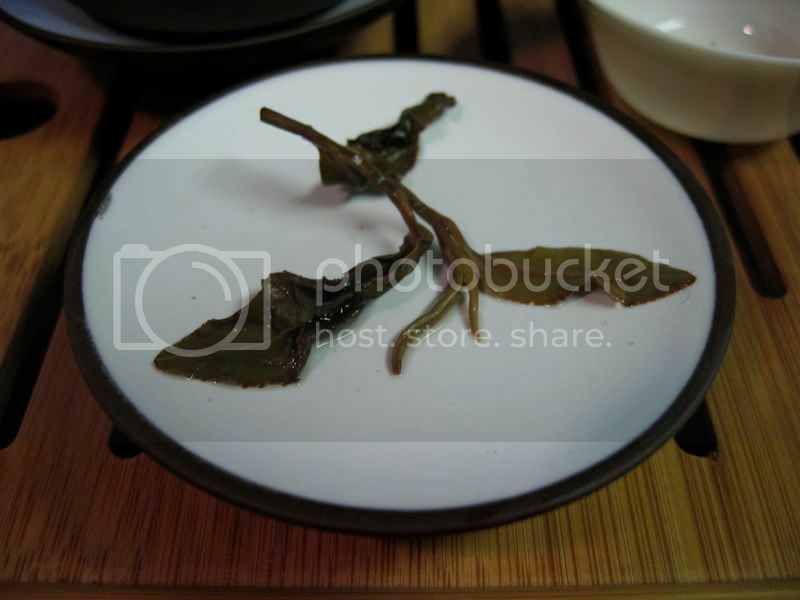 For its excellent taste and utter lack of flaws according to my palate, the Organic Tenbu Shaded Sencha gets a 9.5/10. The dry leaf here is slightly more robust looking than the Tenbu, with fewer fannings. 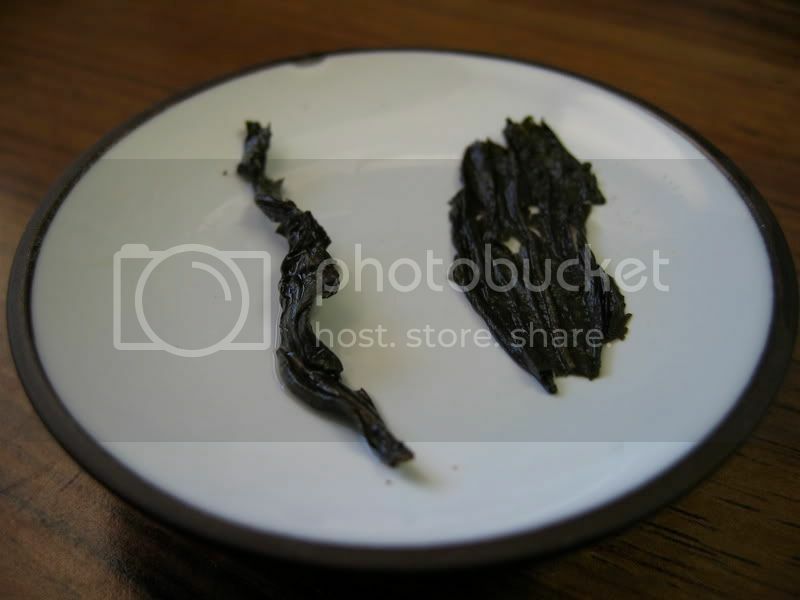 The leaf has a dark green color, similar to the Tenbu. Also, there are a few very long, wiry leaves. The aroma is more grassy and vegetal than the Tenbu, but overall I thought they smelled relatively similar. 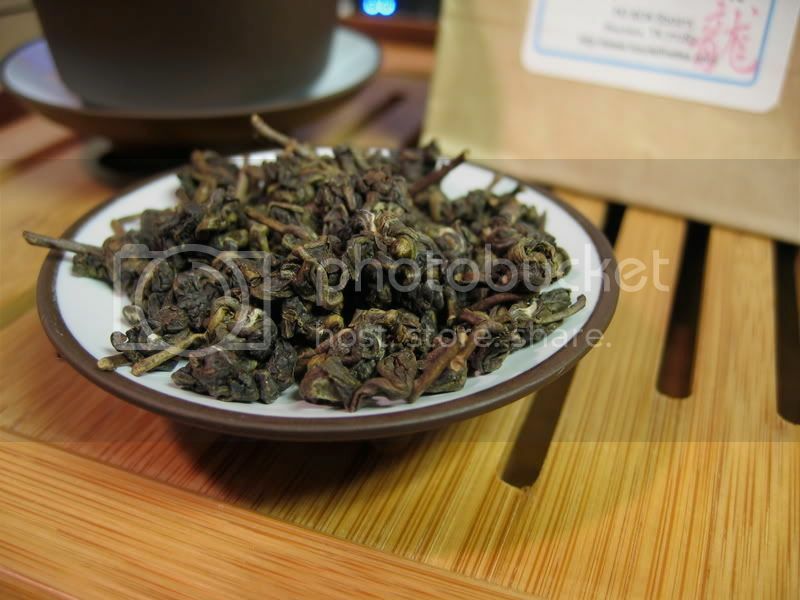 The color of the Tenbu Fuka was almost as excellent as the Tenbu, but it wasn't quite as vibrant in every infusion. The third infusion was a beautiful lime color that surpassed the Tenbu at a similar stage, but I found the other infusions to be duller looking than the Tenbu. Still, compared to most other senchas, I thought the Tenbu Fuka displayed excellent color. I think the Tenbu Fuka has the potential to be much more complex than the Tenbu, but unfortunately I do not think 3g is enough leaf. I found the same candy-like sweetness (perhaps the slightest touch of green apple candy), but I noticed a stronger grassy note and slightly more astringency as well. I also experienced a tingly, almost-perspiring body sensation (I know there is a word for this, but it is eluding me at the moment) at times, which I did not get from the Tenbu. Unfortunately, the way I brewed it, all of the infusions were slightly weak. 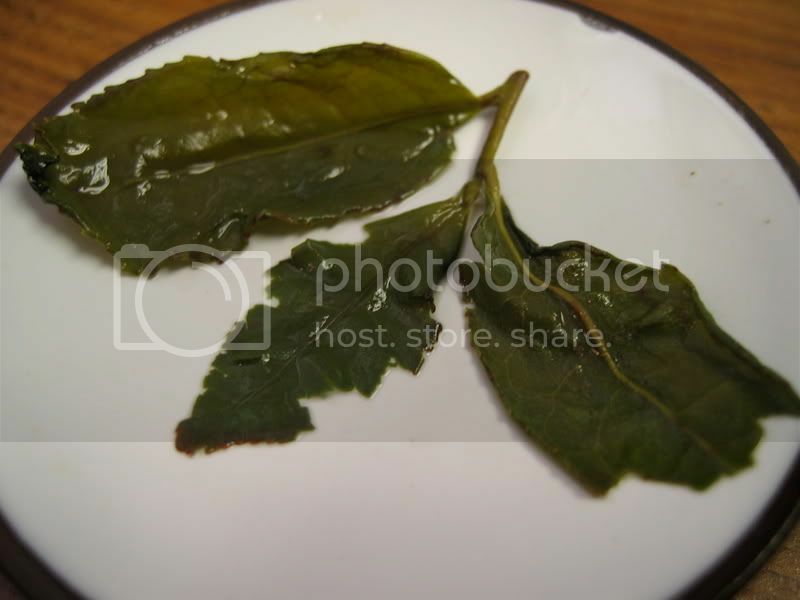 I was not quite as impressed with the Tenbu Fuka as I was with the Tenbu, though this may simply be due to not using enough leaf, as I was limited to the steeping conditions given by T Ching. I think that because there are fewer particles in the Tenbu Fuka, it may require slightly more leaf than the Tenbu to provide the same amount of surface area. Though the Tenbu Fuka seems to have a lot of potential, I still walked away feeling a bit underwhelmed. So, the Organic Tenbu Fuka gets an 8.5/10. I frequently hear praise of a particular tea's "strong fruity flavor" or "amazing cinnamon smell," but rarely do I experience the same level of intensity when I try it for myself. 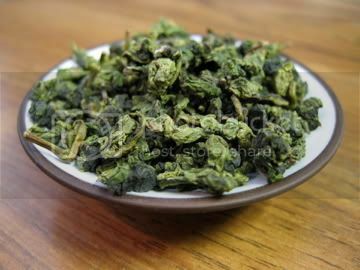 This tea, Jing Tea Shop's Anxi Gan De Hong Xin Tie Guan Yin, is a remarkable exception. For once, I have found the description on a product page to be an understatement. The dry leaves shocked me a bit when I first smelled them. I thought I would open up the bag to find a nice, delicate floral aroma, but what I found could be better described as an intense buttered broccoli/cauliflower smell. Don't get me wrong, it's a nice smell, but I wasn't expecting what I found. It's definitely a vegetal aroma that I hadn't come across until now. As for looks, the dry leaf appears quite nice. There is a lovely mixture of bright green and dark blue-green colors in the leaves, and a bit of tan in the stems. Purty! I'm just beginning to take these kinds of notes, so go easy on me. I just typed up my observations of the wet leaves and the liquor itself, though I tried to be attentive to other things as well. If you have any recommendations for me so that I can take better notes, I would be happy to hear them. Wet Leaves: Smells like buttered broccoli, in a good way. Liquor: Faint green-yellow color. Sweet, floral taste, lingers on the tip of the tongue. Light broccoli flavor, which becomes stronger as the infusion cools. Slightly buttery. Fuller body than I would have expected for such a light-colored tea. Very light astringency-- does not mask anything, but keeps the brew from feeling flat in the mouth. Wet Leaves: Starting to expand quite a bit. Stronger savory butter aroma... mmm! Liquor: Slightly more intense color. Also a stronger buttery aroma. Behind the vegetal taste, there is a nice floral sweetness. Wet Leaves: More savory, even salty, buttery nose. There is still a noticable floral note (perhaps orange blossoms? ), but it is overwhelmed by the intense buttery aroma. Wet Leaves: Similar to last time. Perhaps a bit more sweetness now. Liquor: Sweeter taste coming through, definitely floral. Still buttery, but not quite as savory as before. Wet leaves: More savory again. The leaves have expanded so much, they are overflowing out of the gaiwan. Still some floral aroma. Liquor: A bit of a sharp bitter taste is present now. Slightly odd combination of sweetness and butteryness, as the sweetness is beginning to take over. Wet leaves: The orange blossom note is now dominant, but only by a hair-- the butter is still well-established. There are several other minute aromas, but they elude characterization. Still, they make the aroma nicely complex. Liquor: Still slightly awkward flavor. The floral sweetness is definitely kicking in, and I'm interested in seeing whether the buttery flavor will eventually give way. 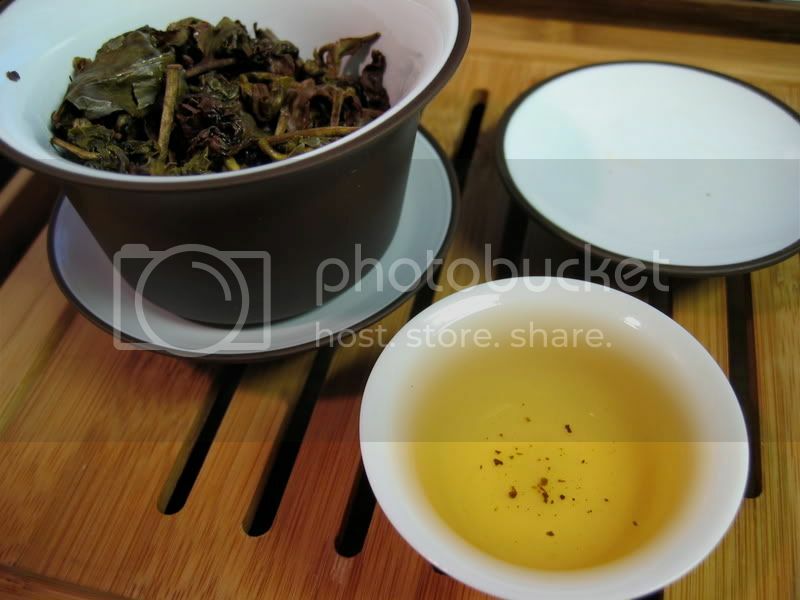 Wet leaves: Fairly similar to last infusion. Perhaps a bit more butter again. Liquor: Yes, orange blossom is now quite dominant. Butter is still lingering in the background, but orange blossom is the heart now. Wet leaves: More butter, also starting to smell a little off, like bad butter. Liquor: A little bitter, perhaps overbrewed, or maybe just running out of steam. This was certainly an interesting tea, and I appreciate its complexity and its unique character. Still, it is tiresome to get through the middle infusions (4th-6th), which have an awkward combination of savory and sweet flavors. I also have a hard time preparing myself for such a savory tea as I tend to favor sweeter ones, but that is my fault and not that of the tea itself. My favorite infusion was the 3rd, followed closely by the 7th. These were my favorites because they were the brews when the butter and floral notes best complemented each other. In the 3rd infusion, there was a subtle hint of orange blossom that I found intriguing, and in the 7th infusion, I found myself with more of a floral-tasting tea, but without any real loss of character. I didn't think that I would ever find a tea with such a strong pair of independent flavors, and I am quite impressed with how it completely transformed in flavor from the first infusion to the last. On technical details alone, I would give this tea a 9.5, but unfortunately I just didn't find it extremely enjoyable. The salty, savory flavor is nice, but not usually what I want in my tea; and the middle infusions are, unfortunately, not very pleasant. Even though Jing Tea Shop's Anxi Gan De Hong Xin Tie Guan Yin isn't as enjoyable as some other teas I have had, it was extremely interesting. Overall, it gets an 8/10. Astringency is quite possibly the least understood of tea's veritable cornucopia of flavors. Many people know it only as an unpleasant bitterness, but I would argue that this is NOT necessarily the case. While too much astringency can taste awful and bitter indeed, a total lack of astringency can leave your tea tasting flat and boring. The right amount, though, can add complexity and intrigue to your standard cuppa. This is the kind of astringency that we have all likely noticed at one point or another. This is the unpleasant, extremely drying form of astringency that is not usually sought-after. This taste will leave your tongue uncomfortably dry for a prolonged period of time. Kam calls this type "Se." This type of astringency isn't really anything to write home about. This type will still leave your tongue feeling dry, but not nearly as uncomfortably as rough astringency will. Though I don't particularly like this type of astringency, I don't hate it either, and some people actually enjoy it. Often this is a natural property of the tea, and will come out no matter what, but sometimes it is a result of over-steeping or using too many leaves. Kam calls this type "Ku." This is the kind of astringency that I love and crave. It is unique in that it seems to stimulate your tongue to produce excess moisture, and leaves your tongue feeling oddly dry and wet at the same time. It can also produce a kind of cooling effect when you breathe. Kam notes that this is also a minty feeling, and calls it "Gan." Kan also describes "Hui Gan," which is a prolonged stimulating astringency (minutes to hours). This is very rare, and very very nice. I have only experienced this once or twice, as you need a very high quality tea and the brewing has to be right on the spot. I've only experienced this with the Makaibari Vintage Muscatel Second Flush Darjeeling that I reviewed earlier, but I'm sure there are others out there that can produce this wonderful effect. This type of astringency is absolutely awful. It may simply be an extreme form of rough astringency (Se), but it is so horrid that I think it deserves its own category. I have most often encountered this astringency when brewing gyokuro (shaded Japanese green tea) with water that is far too hot, but it can manifest itself in other non-/lightly-oxidized teas as well when brewed with too much leaf or too much heat. As you could likely surmise from the name, this type of astringency is marked by a metallic, yet also strangely organic taste. If I ever get this in my tea, I just throw out the entire infusion. Note that if you get this flavor, it is almost definitely a result of human error-- I don't think any producer makes tea that intentionally tastes like this. Though I have absolutely no idea what causes one type of astringency to present itself versus the others, but I can share a bit about the basics behind the chemistry of astringency. Despite what you may have heard, tannins are not responsible for astringency or bitterness in tea. There are essentially zero tannins in tea. As far as I can tell, the word "tannins" only became part of the tea lexicon because tannins cause astringency in wine, and someone just ported it over to describe tea. 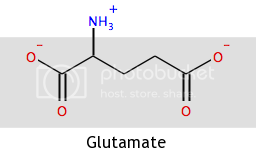 The correct term for the compounds that cause astringency in tea is polyphenols. Though tannins are also polyphenols, not all polyphenols are tannins. 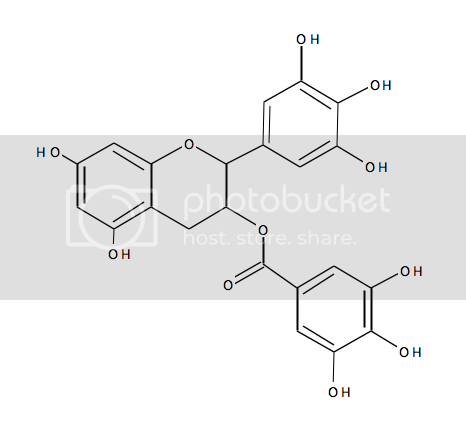 The simplest polyphenol is just an aromatic ring with two or more hydroxyl (-OH) groups attached to it (as opposed to an aromatic ring with only one hydroxyl, which is simply called phenol), but biological polyphenols are often much more complicated than this. 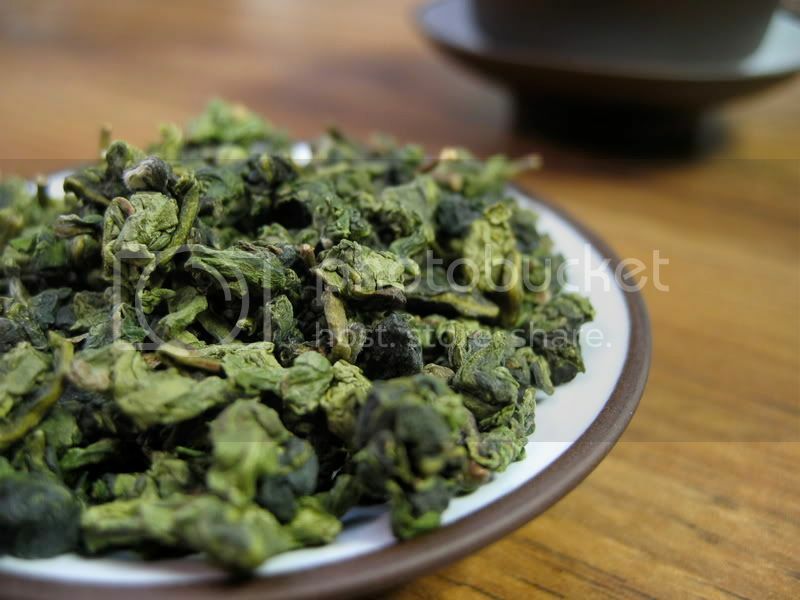 The majority of polyphenols found in tea are catechins, which make up about 25% of the leaf's dry weight, such as EGCG (epigallocatechin gallate), shown here. 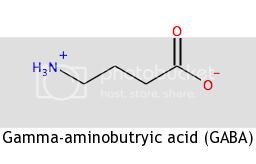 Polyphenols cause the astringent sensation by binding with salivary proline-rich proteins (proline is one of the 20 main amino acids, and is quite unique in its structure) to form insoluble chemical complexes, thus reducing salivary lubrication, causing a drying sensation in the mouth. An abstract discussing this mechanism can be found here). Though it is often looked down upon and considered as nothing more than bitterness, I think the right kind of astringency can be one of tea's most interesting characteristics. Hopefully, this information will allow many of you tea drinkers to more fully appreciate the astringent qualities of tea, or at least think twice about using the word "tannins" ever again (please, I'm begging you). Hey all, just wanted to keep you up-to-date. I haven't done any reviews lately, because I've just received a whole bunch of oolongs and I've been teaching myself how to properly taste them. I've improved my gaiwan-brewing skills a great deal, and I think I've found another favorite tea. 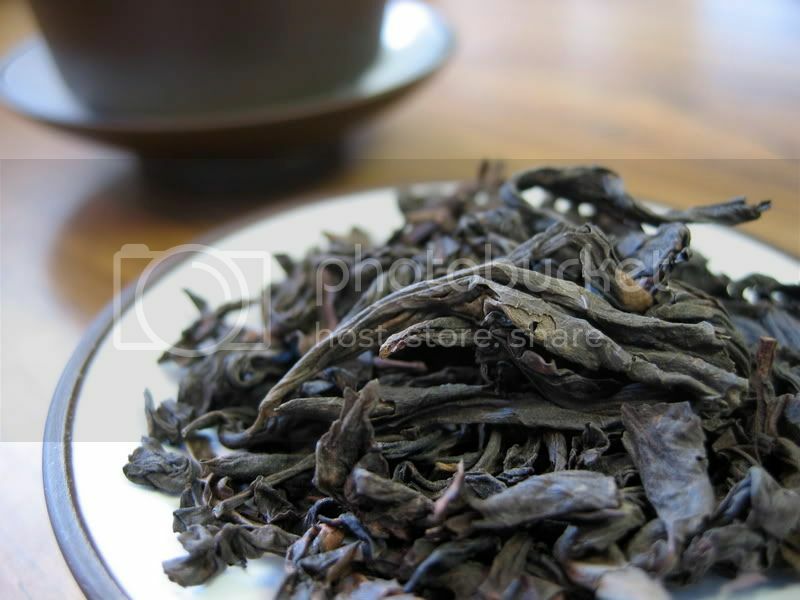 Anyway, in a week or two I'll start putting up a series of wuyi oolong notes and reviews, so stay tuned. 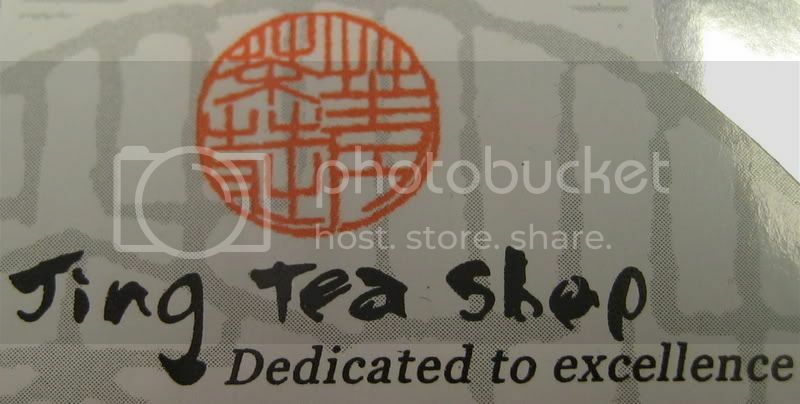 Also, during my absence, I encourage you all to visit the other tea blogs I have listed on the left-hand side of this page-- there are some real gems in there, and some that put this little project to shame. As always, brew, drink, and be nerdy.